Whoa, you go on vacation to the historical city of Boston to escape the renovation mania back home and what happens? On the Freedom Trail of all places? 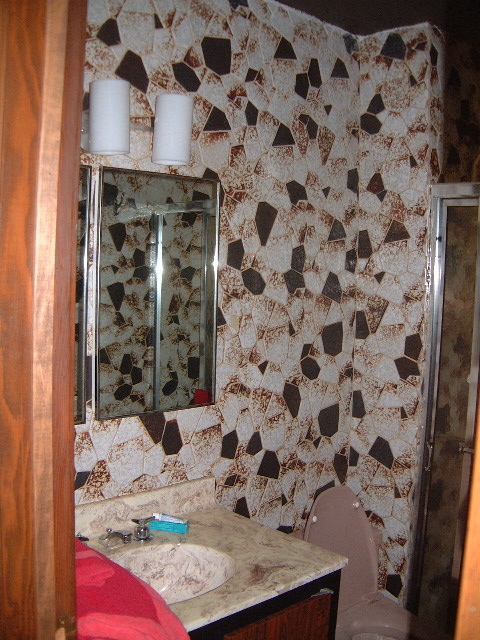 We spy the same bathroom tile we have in the 1970s boys' bathroom in a North End appartment entrance. They also used it on the floor and walls. I thought ours was unique and maybe should be preserved as such but now we'll definitely have to redo the crazy batcave bathroom. Boston is definitely not the place to go if you want to get away from your home improvement obsession. I don't think there's a building here that isn't under or in need of a renovation. For vacation I like to find some suburb of a smaller city where they are still turning farmland into new subdivisions and fantasize about living in the brand-new houses for pennies on the dollar.